There are plenty of great things to see in Barcelona – but there aren’t many that are as spectacular as La Pedrera, officially called Casa Milà. This gorgeous building is one of the two houses famous architect Antoni Gaudí designed on the grand Passeig de Gràcia. Though there are plenty of pretty buildings on the street, this one stands out immediately. But though you can get a wonderful view from street level, there are plenty of things that you can only enjoy by going inside the building. 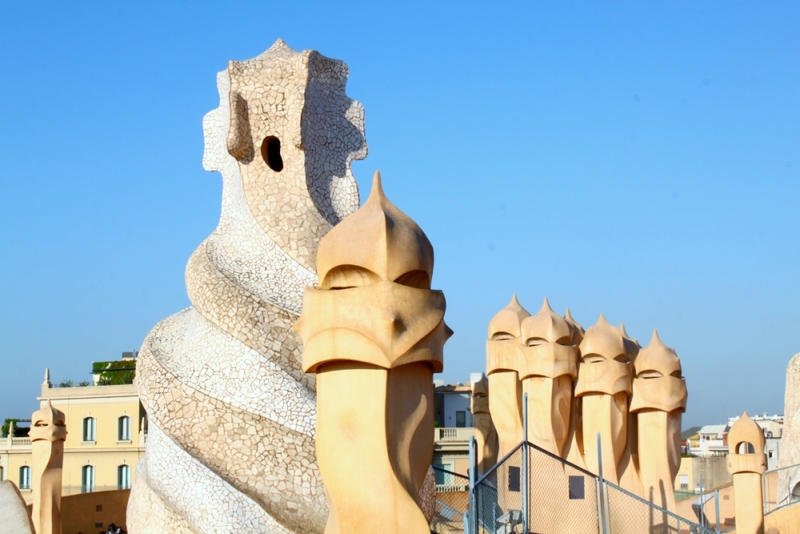 Here are 8 reasons why you should visit La Pedrera! Can you imagine this being your home? That’s exactly what the Pedrera is for some people! It was originally built for a wealthy couple, Pere Milà and Roser Segimon, which is where the name Casa Milà comes from. After Milà’s death, the building was sold and divided into apartments. Today, there still people who live here! You can’t have a nosey round their homes, but you can see one of the apartments with period furniture, which gives you a great idea of what it was like. Gaudí’s work incorporates lots of truly revolutionary techniques, which is part of the reason it looks so unlike anything else. 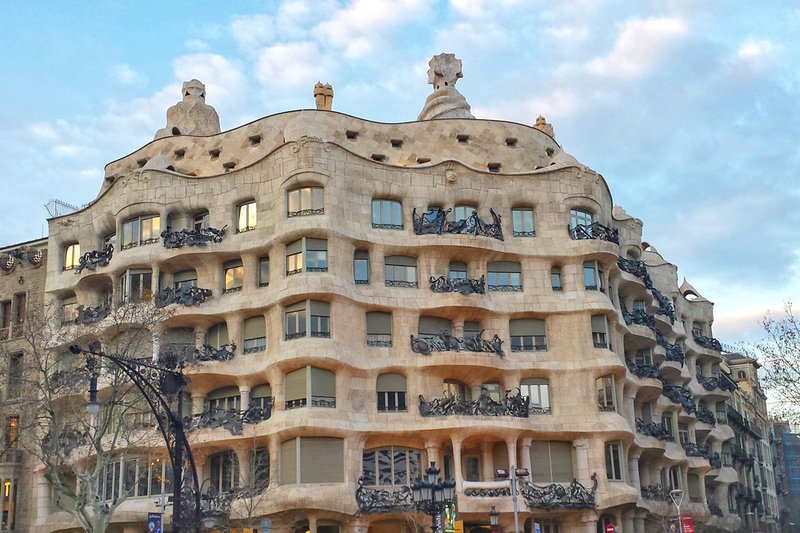 La Pedrera is architecturally fascinating, even for non-experts. For instance, there aren’t any load-bearing walls inside – it’s all held up by a self-supporting stone structure and columns in the interior patio. The house is also a constant curve, so there are no straight lines! 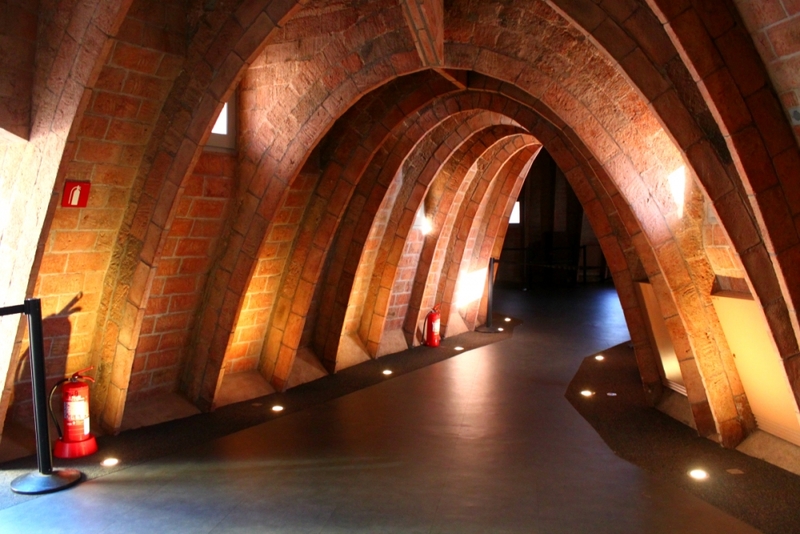 You can see a really cool model of the catenary arch that he used in lots of his projects in the attic of La Pedrera. Though Casa Milà is much adored by locals and visitors alike these days, it hasn’t always been popular. In fact, its nickname, La Pedrera, translates to “The Quarry”, which wasn’t intended as a compliment. It was the pointed subject of plenty of satire in the early 20th century. Milà’s neighbors even stopped saying hi to him in the street – because they thought the building would bring their property values down! The house was originally supposed to be crammed with religious symbols in Gaudí’s designs. But lots of these ideas were vetoed by the owners when anti-religious sentiments reached a high in the city. And its cinematic one, too! If you are, then these towers below might remind you of Darth Vader! Legend has it George Lucas was inspired after a visit to La Pedrera. Is the rumor true? I couldn’t find anything online from a reputable source that confirmed this, but the similarities are striking. What is definitely true is that it’s been used as a setting for over fifteen different movies! There are a combination of free and paid exhibitions as well as activities that are always going on at La Pedrera. This might range from a special piece of art on display in the building or a musical residency by a talented musician. 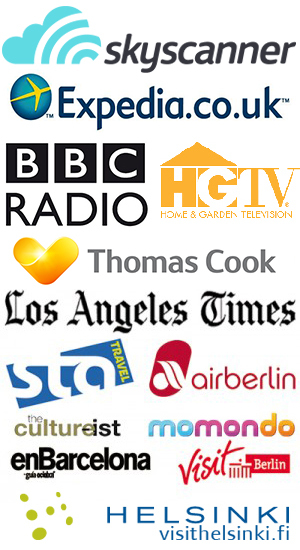 You can check out a list of what’s on right now here. Fun fact: the exhibition hall is where the Milà family lived. When night falls on Passeig de Gràcia, you can enjoy a special light art project that brings La Pedrera tonight. It’s called “Gaudí’s Pedrera: The Origins” and literally lights up parts of the building to explain the architectures inspirations. You’ll finish off with a glass of cava, and can also enjoy dinner in the building too. When you visit a Gaudí building, part of the fun is discovering how the brilliant architect took care of everything down to the smallest details. Look out for things like the intricate wrought iron balconies perhaps inspired by seaweed, and the glittering covering of one of the towers on the rooftop. This was originally made from smashed cava bottles that had been emptied at the inauguration party for the building (it’s since been restored). 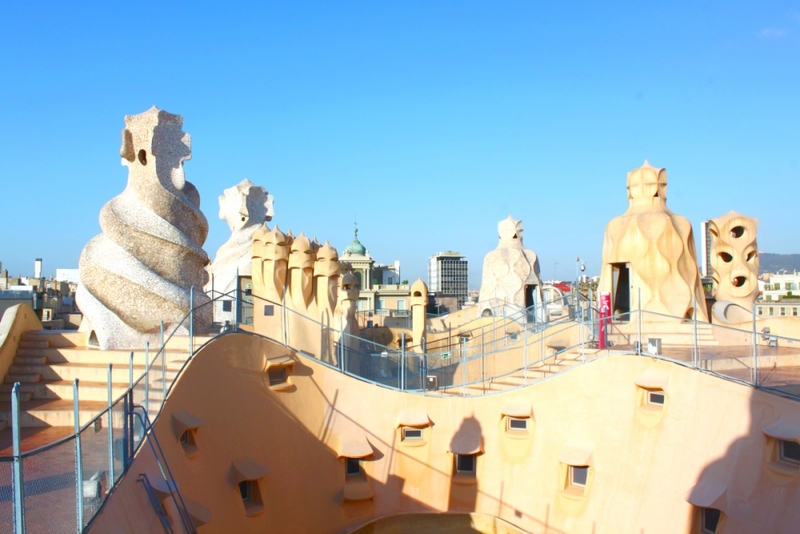 This is the top reason you should visit La Pedrera – the undulating rooftop filled with whimsical structures is breathtaking. It’s like a drawing of a fantastical world has been brought to life. On top of that, it has incredible views of the city, including an arch that perfectly frames the Sagrada Familia in the distance. There’s nowhere else quite like this, and access to the rooftop alone is well worth the price of the entry ticket. Hours: Monday-Friday: 9 a.m. – 6 p.m. Saturdays, Sundays, and holidays: 10 a.m. – 2 p.m.
Have you ever visited La Pedrera? What was your favorite bit?